It’s no doubt that without cranes, constructing tall buildings would be nearly impossible. With Miami currently having the third tallest skyline in the United States, cranes are vital to construction of newly created highrises and additions to finished buildings. 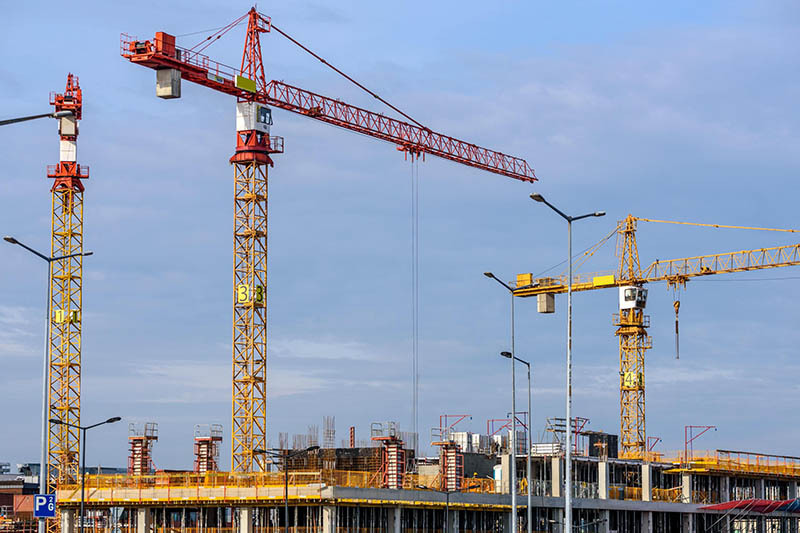 The use of cranes are to supply heavy building material to the higher stories of a building project, as well as playing a role in assembling the building itself. Cranes are extremely helpful in the construction process, but it is important that they are used safely and operated by a licensed professional. Unsafe use of a crane while on site can lead to injuries and even death. Dropping Loads & Falling Materials – If a crane’s load is dropped, it will crush anything below it. People should never work directly below a crane. Smaller materials can be blown off by wind or from the velocity of the crane’s movement. To prevent injury from smaller material being taken by the wind, workers on site should always be wearing hardhats and other Personal Protective Equipment. Overloading the Crane – If a crane is lifting too much weight, it can tip over. Operators should know how much weight a crane can handle to avoid overloading a crane. Only licensed crane operators can operate a crane, and should be aware of how much they are loading and if the crane’s position affects load bearing. Pinch Points – Cranes may have to twist in order to get a load to the proper place. Twisting the crane can create pinch points that can cause serious injuries. Be sure that the crane operator is aware of their surroundings, as well as the locations of the other workers on the sites. To ensure the safety of the workers, keep a moderate distance from the crane operator’s booth, as that is home to many blind spots and can create further pinch points. Anyone working on or near a crane should be trained on how to use a crane safely. Employees should know the hazards of using a crane so they can avoid being injured. Make sure your jobsite has safety procedures in place for using cranes. The crane safety procedures should account for all the hazards a crane can create and it should develop a plan for how to minimize or eliminate the hazards. Hazards from the environment, the equipment, and the site itself can be present while using a crane, and the necessary steps must be taken to ensure safe operation. Cranes should be inspected before they are used. Make sure that your jobsite has a crane inspection list that is used to inspect a crane before operating it. If a crane is not working properly it can lead to devastating consequences. Inspections can help identify any issues before the crane is used. It is advised (and often required) to inspect cranes before each use every day, in order to ensure that it is safe to operate and that each worker is aware that the crane is in use. Anyone working on or around a crane should wear proper Personal Protective Equipment (PPE). Hardhats must always be worn to protect workers’ heads from materials that may fall from crane. Hand protection is needed when loading or unloading a crane. Crane operators must wear eye protection to prevent dust or dirt from getting in the eyes, even if they are in the operator’s cab. If you need PPE for your jobsite, TSC Southeast has a wide selection of hard hats, safety glasses, and gloves through our safety supplier, Safety Supplies Unlimited. TSC Southeast knows how important it is to use a crane safely. We can help make the cranes on your construction site safer by developing protective structures for them. Crane protection from TSCSE includes furnishing and installing plywood walls around the base of the crane. The use of walls around the base creates a barrier to ensure the crane is separated from the rest of the workers on the site. We also provide the proper signage to warn workers of hazardous work conditions, as well as site safety managers to supervise sites and ensure high safety standards. In areas where hurricanes may occur, cranes should be protected. Cranes can fall over during high winds which can lead to devastating consequences including deaths and destruction of property beyond the construction site. If in the event of a hurricane with strong winds occurs, it is advised to not only not operate the crane, but potentially disassemble if there is time available. Many hurricanes have reached wind gusts of over 150 mph, causing massive damage to the surrounding area. It is highly advisable to keep cranes secure during high winds. TSC Southeast can help you be prepared for a hurricane by developing safety solutions that will help keep your jobsite safe. If you need crane protection for your jobsite or crane safety training, contact TSC Southeast.